When it comes to our retirement funds, we all want the same thing—to make sure our money is in the right accounts, invested in the right funds, and in the end, making us money! This begs the question: Which investment vehicles should we choose? First things first: A 401(k) isn’t a mutual fund. It’s a retirement savings plan sponsored by an employer. It’s named after the subsection of the IRS code that talks about retirement plans. A 401(k) plan allows you as an employee of a company to invest a percentage or amount from your paycheck before taxes are taken out. That money goes into a mutual fund. Then, that money, along with any money you’ve made from your investments, gets taxed when you take it out of your account at retirement. If your company goes under, your 401(k) is safe and you can roll it over directly into another retirement account. 403(b)—Also called a TSA, or tax-sheltered annuity. This plan is for tax-exempt organizations like public schools, hospitals, or religious groups. 457(b)—This plan is offered by state and local governments and some nonprofits. Employer-sponsored programs, like 401(k), 403(b) and 457(b) plans, allow your company to match the amount of money you put into them—but matching is not required by the government. You need to find out if your employer offers a match so you can make the most of your investing dollars. We’ll dive into more about that later. You can invest up to $18,500 a year in a 401(k), 403(b), or in most 457(b) plans. Now, if you’re 50 or older, you can add an additional $6,000, for a total of $24,500. (1) That limit doesn’t include any matching contribution from your employer. While a 401(k) is a great retirement planning tool, it’s not perfect. Your employer hires a third-party administrator to run the company’s retirement plan. That administrator chooses the different mutual funds you can invest in. That means you don’t have an unlimited choice of mutual funds. Also keep in mind that if you’re new to a company, you may have to wait to participate in a 401(k) plan. Another downside of a 401(k) is a rule called Required Minimum Distributions (RMDs). You must start taking out a certain amount each year, beginning at age 70 ½, or you will pay a penalty. You can’t leave your money in there indefinitely. There are also penalties for withdrawing money before age 59 ½. Either way, Uncle Sam wants his share! An IRA is an Individual Retirement Arrangement (IRA). It’s an account used to save money for retirement, but it’s not sponsored by your employer. 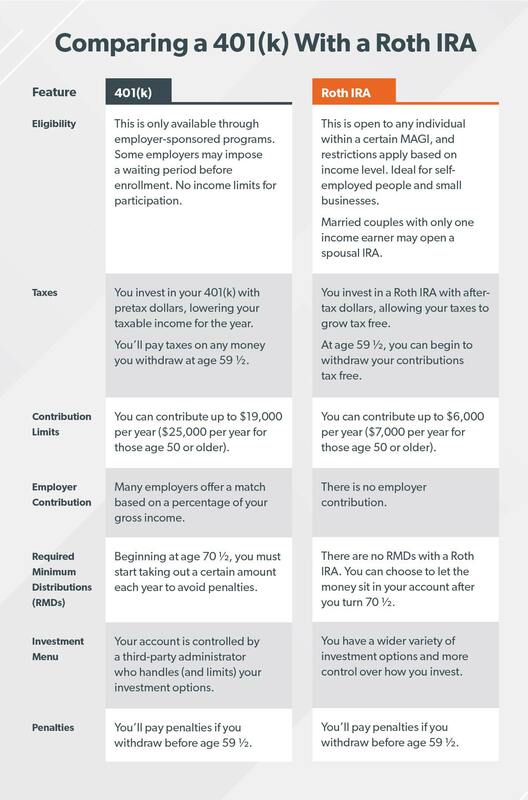 An IRA is a great option for people who are self-employed or who work for small businesses that don’t offer a 401(k) program. And an IRA can be a great option for saving extra money for retirement once you’ve maxed out your 401(k). A Roth IRA is a type of IRA, but with a few differences. With the Roth IRA option, you’ll pay taxes on the money before you put it into the account. The money grows tax-free, and you don’t pay any taxes on it when you take it out in retirement. You can invest up to $5,500 in a Roth IRA each year, or $6,500 if you’re age 50 or older. (2) However, there are income limits for contributing money to a Roth IRA. If you are single or the head of a household, your modified adjusted gross income (MAGI) has to be less than $120,000. If you’re married and file your taxes jointly with your spouse, your MAGI must be less than $189,000. If your income is above these limits, the amount you can invest is reduced. And if you make $135,000 or more as a single individual or $199,000 or more as a married couple filing jointly, you’re not eligible for a Roth IRA. (3) However, the traditional IRA would still be an option. Like the 401(k), you’ll be penalized for taking money out of a Roth IRA before age 59 ½ unless you meet specific requirements. However, with a Roth IRA, you won’t be penalized if you don’t start taking out money at 70 ½ as long as you hold the Roth IRA for at least five years. A Roth IRA has some advantages over a 401(k). The biggest benefit is the tax break. While you pay taxes on the money before you put it into a Roth IRA, the growth is not taxed and you won’t pay any taxes on the money when you take it out at retirement. That’s important if you think you’ll be in a higher tax bracket at retirement. Another huge plus is a bigger selection of investing options. With a Roth IRA, you don’t have a third-party administrator choosing which funds you can invest in. That gives you a larger variety to pick from. But remember, never invest in anything you don’t understand! Unlike a workplace retirement plan, you can open a Roth IRA at any time as long as you deposit the minimum amount. (That amount will vary based on who you open your account with.) You don’t have a waiting period. And a Roth IRA is often easy and inexpensive to open, making it a great option if you’re just starting to invest and your employer doesn’t offer a good 401(k) plan. Just like a 401(k), a Roth IRA has its drawbacks. The biggest one is the contribution limit, which is lower than a workplace retirement plan. People ask me whether they should put their money in a 401(k) or a Roth IRA. The answer is yes. If possible, I want you to invest the maximum amount allowed in both investing options. That way, you’re taking advantage of any employer match while also getting the tax benefits of a Roth IRA. Here’s how that works: Let’s say you make $55,000 a year and want to save 15% of your income—$8,250—for retirement. Your employer offers a match on your 401(k) contributions up to 3% of your gross income, so you put $1,650 in that account, leaving you with $6,600 to put in a Roth IRA. Since the maximum contribution to a Roth IRA is $5,500, you max that out, leaving you with $1,100 to invest. Then you return to your workplace 401(k) for the remaining amount. People often ask me what to do if your employer doesn’t offer a 401(k) and you’ve maxed out your Roth IRA for the year. The short answer? Remember, investing is a marathon not a sprint. There’s a new kid on the investing block—the Roth 401(k) plan. Over 52% of companies that sponsor a workplace retirement plan offer a Roth 401(k) as an option. (3) Think of it as a hybrid—you get the tax benefit of the Roth option, but it’s offered through the workplace like a traditional 401(k). If you invest in a Roth 401(k) plan, your contributions are taxed before you put them into the account. Once in the investing account, that money grows tax-free and can be withdrawn tax-free in retirement. If your company offers a Roth 401(k), you can invest 15% of your income into that account and not have to worry about juggling your contributions between your 401(k) and Roth IRA. And if your company offers a match to your investments into a Roth 401(k), then you’re getting free money! One detail, though—your employer’s match will get taxed. When people ask me about my best investing advice, I always encourage them to take one important step: Talk with an investing professional. They have the education and experience and can give you the best advice on your investing options. They can help you run the numbers and make the most of your hard-earned money. I meet with a financial advisor myself, and I know how beneficial they can be! If you need help finding an advisor, check out SmartVestor. You’ll be connected with professionals in your area who are ready to help you maximize your retirement dollars.